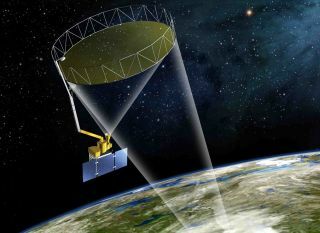 NASA's SMAP satellite is designed to map Earth's soil moisture once every three days or less. It's scheduled to launch on Jann. 29, 2015. NASA's next Earth-observing satellite is ready to launch Thursday (Jan. 29), and it could vastly improve the way scientists monitor droughts around the world. The space agency's Soil Moisture Active Passive satellite (SMAP) is scheduled to launch from California's Vandenberg Air Force base atop a United Launch Alliance Delta II rocket at 9:20 a.m. EST (1420 GMT) on Jan. 29, and at the moment, weather is looking good ahead of liftoff. Officials are predicting an 80 percent chance of good conditions during the 3-minute launch window Thursday. "What the soil measurements will do is improve our weather forecasts, improve our assessments of water availability and also address some issues dealing with long-term climate variability and assessments of the impact of human intervention in the global environment," Dara Entekhabi, SMAP science team leader, said during a news conference Tuesday (Jan. 27). "All of these come together and it's the metabolism, how it responds, just like a human body." NASA's Soil and Moisture Active Passive satellite, or SMAP, is attached to its Delta II rocket for a planned launch from California's Vandenberg Air Force Base in California on Jan. 29, 2015. The mission will study Earth's soil moisture from space like never before. You can watch live coverage of the SMAP satellite launch starting at 7 a.m. EST (1200 GMT) Thursday (Jan. 29) on Space.com via NASA TV. The SMAP probe comes equipped with a huge mesh antenna, expected to be deployed sometime after launch. At nearly 20 feet (6 meters), the antenna is the largest of its kind that NASA has ever flown in space, officials have said. SMAP's antenna is designed to spin at about 14.6 revolutions per minute while mounted to the end of a long arm on the satellite's body. The satellite is built to measure moisture in the top 2 inches (5 centimeters) of soil from its spot in orbit about 426 miles (685 kilometers) above Earth's surface, completing an orbit once every 98.5 minutes. The satellite's unprecedented soil information could help scientists learn more about how droughts spread and the places where they occur. By knowing the moisture in topsoil ahead of time, it could also help researchers better-predict where floods will happen. "Soil moisture is a key part of the three cycles that support life on this planet: the water cycle, the energy cycle and the carbon cycle," NASA SMAP program executive Christine Bonniksen, said during the news conference. "These things affect human interest: flood, drought, disease control, weather." The rocket carrying SMAP will also deliver four small cubesats into Earth's orbit during the launch as part of NASA's Educational Launch of Satellites program. One cubesat, called ExoCube, will monitor the upper atmosphere from orbit. Two Firebird satellites will investigate the radiation environment around Earth, and the GRIFEX satellite is a technology demonstration partially developed by NASA's Jet Propulsion Laboratory. The $916 million mission is expected to last about three years or more. SMAP is one of five NASA Earth-monitoring satellites originally scheduled for launch in 2014. Three of those missions — Orbiting Carbon Observatory-2 satellite, Global Precipitation Measurement Core Observatory and ISS-RapidScat — got off the ground last year. But SMAP and the recently launched Cloud-Aerosol Transport mission mounted to the International Space Station were delayed until 2015.